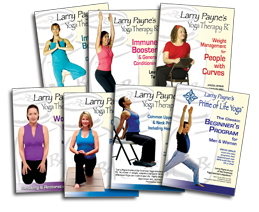 Home About Larry Payne, Ph.D.
Larry Payne, Ph.D., is an American pioneer in Yoga and Yoga Therapy. The Los Angeles Times named Larry “One of America’s most respected Yoga teachers.” He is the co-author of five books, including the international bestseller Yoga for Dummies and, most recently, Yoga Therapy and Integrative Medicine. 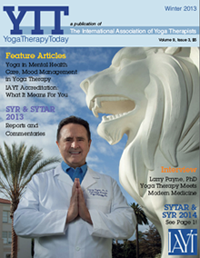 1989, Larry became the founding president of the International Association of Yoga Therapists, now represented in 50 countries. He was also the founder of the corporate Yoga program at the J. Paul Getty Trust, the world’s largest cultural and philanthropic organization dedicated to the visual arts. Larry was the first ever to present Yoga to world leaders gathered at the World Economic Forum in Davos, Switzerland in 2000. 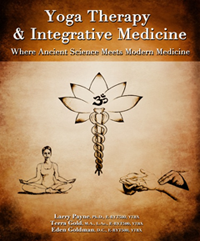 Another first was achieved when Larry created the Yoga and Yoga Therapy curriculum at the UCLA School of Medicine. More recently, he founded the Yoga Therapy Rx & Prime of Life Yoga certification programs at Loyola Marymount University in Los Angeles, CA. Larry’s entry into Yoga was motivated by personal reasons: In 1979, he was an advertising sales executive, plagued by chronic back pain and other stress-related problems. His search for relief led him to his first Yoga class, and eventually his study of Yoga and health in eleven countries. Ultimately, his journey inspired his career change upon receiving Yoga teaching certification in India. In 1980, Larry founded the Samata Yoga Center in Los Angeles and later earned a Master’s degree and a Doctorate in fitness education with an emphasis in Hatha Yoga from Pacific Western University. His background is in Psychology and he has also completed graduate work in Physical Therapy at Cal-State University at Long Beach, CA. He was the U.S. representative to the first World Congress of Yoga in Montevideo, Uruguay, and has received outstanding achievement awards for Yoga in Europe, South America and the U.S.
For more than 30 years, Larry has led the Healthy Back Program at the world-famous Rancho La Puerta Fitness Spa in Tecate, Mexico. His six award-winning Yoga DVDs were filmed there. Larry has been a frequent guest on national television and syndicated radio programs and his work has been featured in numerous national and international publications, including The New York Times and O the Oprah magazine. Larry resides in Los Angeles, CA and has a thriving practice in Marina del Rey. In addition to speaking engagements and workshops, he leads Yoga and health seminars worldwide.